Chasing Oscar: The Shape of Water is a Weird, Whimsical Tale of Romance and Resistance – When Things Go Pop! 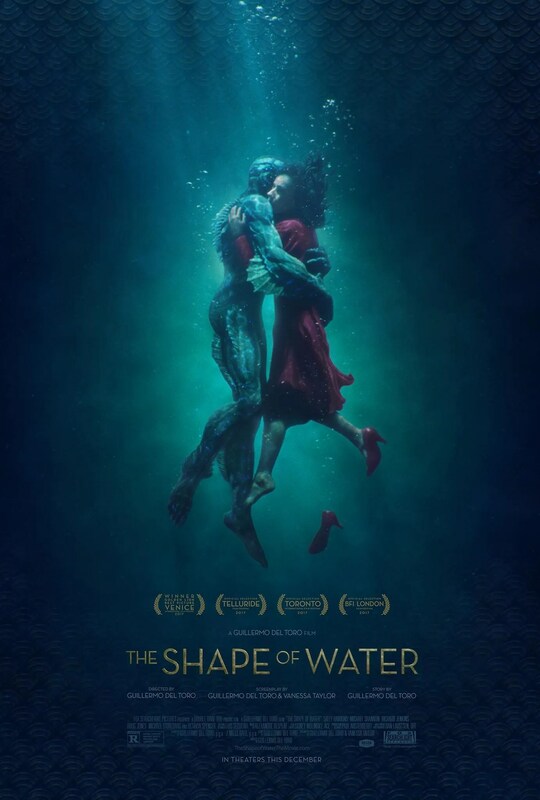 Fourth in the Chasing Oscar series: visionary filmmaker Guillermo del Toro submerges audiences in an aquatic love story. In this post-Weinstein awards season, The Shape of Water might seem like an oddball of a contender. And yet, this Cold War-era fantasy from Guillermo del Toro feels surprisingly of-the-moment. As Hollywood works to speak truth to power, Elisa (Sally Hawkins) is silenced by nature. A mute since infancy, Elisa lives a staid, isolated existence above a movie theater, working as a janitor in a government facility at night. Her life of anonymity ends when she discovers the lab’s secret: an amphibious humanoid creature. Sensing his intelligence, Elisa bonds with the creature, and is horrified to learn he is being tortured by security head Colonel Strickland (Michael Shannon) and experimented on to aid America’s efforts against the Soviets. She resolves to save her fishy friend, with the help of her co-worker Zelda (Octavia Spencer), her next door neighbor Giles (Richard Jenkins), and Dr. Hoffstetler (Michael Stuhlbarg), a Soviet spy doctor with a heart of gold. Freed from the aquatic prison, Elisa and the creature develop a highly improbable but touching romance, with Strickland – and time – as threats to their happiness. The Shape of Water sources much of its dramatic tension from Elisa pushing against her societal limits. Elisa’s inability to speak – as well as her gender – makes agency a luxury she often can’t afford. It’s through her relationship with the creature, a being with even less rights than she, that she challenges the status quo and stakes her claim in the world. It’s a mood that permeates through her circle of comrades, which includes a black woman and a closeted gay man. They all take steps, big and small, against the sexism, racism, homophobia and ableism that runs so casually through their lives. It’s a surprising, welcome thread, although it sometimes runs against the film’s main focus: the interspecies co-mingling. Comparatively, Elisa’s romance with the creature is idyllic, free from the politics and biological trappings one would expect to interfere. The two submerge themselves, figuratively and literally, and dare us to find issue. Admittedly, there are some. The film doesn’t weave its narrative as tightly as it could, settling between fish-out-of-water thriller and romantic fantasy and leaning close to the latter without fully resolving the former. The imbalance glares when Shape veers into the surreal; one such scene pushes it far enough to nearly rob Elisa of a particularly powerful moment. To his remarkable credit, del Toro does hold the film together through the sheer force of his vision. The world through his lens is so engrossing and detailed, that you could be forgiven for just following along and accepting the weird with the visual splendor. Look no further than when he takes his camera underwater, where the magic he is able to capture far outweighs our silly notions of logic. Shape boasts an absolutely stacked cast, one of the year’s strongest ensembles (its lack of a SAG nomination in that category is confounding). Sally Hawkins, who speaks no more than a sentence in the film, is excellent. She sizzles – with anger, joy, sensuality – on screen, deploying so much emotion through her expressions that words would be redundant regardless. Oddly being ignored this season is Michael Shannon’s work as Strickland, an especially execrable mold of white male privilege. Shannon’s tracking of how ineptitude fuels inhumanity feels particularly resonant, maybe too much for most awards voters. Taking his place in some awards slots is Richard Jenkins, who has some lovely moments as Giles. Octavia Spencer, fresh off a Best Supporting Actress Oscar nod for Hidden Figures, brings more than enough welcomed levity and warmth as Zelda to warrant another. The Shape of Water is a very good film, often mesmerizing with its technicality and the purity of its romance. Sometimes the fantasy and reality clash, but there is beauty in the weirdness on display. It will surely walk away with several Oscar nominations – and wins – in the technical categories; what remains to be seen is whether voters will tap into the film’s subtle nods to resistance and reward it with a Best Picture trophy.